Hello everyone, Today I made this card using an unbranded stamp set. 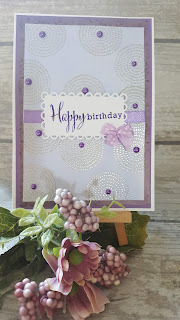 I heat embossed the stamped images using my Wow Silver embossing powder and after I had heat set them I used a finger dauber and went over the stamping using my Shaded Lilac distress ink. I love the results you get from the embossed resist technique. I then embellished my card using a lilac ribbon and matching small bow. I stamped my sentiment using Grape Jelly memento ink and then I embosssed over it with my clear embossing powder. I enjoyed making this card. Hope you like it. I will leave a link for you to watch the tutorial over on my You Tube channel if you are interested.